This review of the genus Miguelia Aver. includes a brief characterization of the genus, a key for species identification, appropriate taxonomic citation and synonyms for each species, and notes on ecology, phenology and distribution. Miguelia cruenta, discovered in southern Vietnam, is described and illustrated as a new species. The tentative relationship of the newly discovered species is briefly discussed. Leonid V. Averyanov and Truong Ba Vuong. 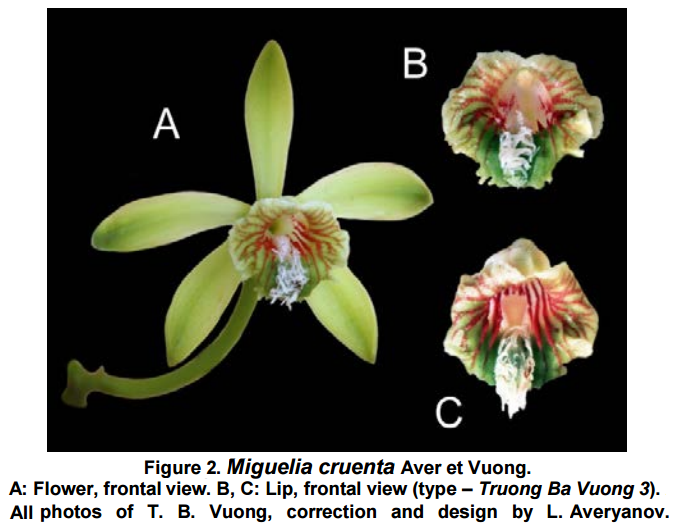 2015. Review of the Genus Miguelia (Orchidaceae) with A New Species, M. cruenta, from southern Vietnam.